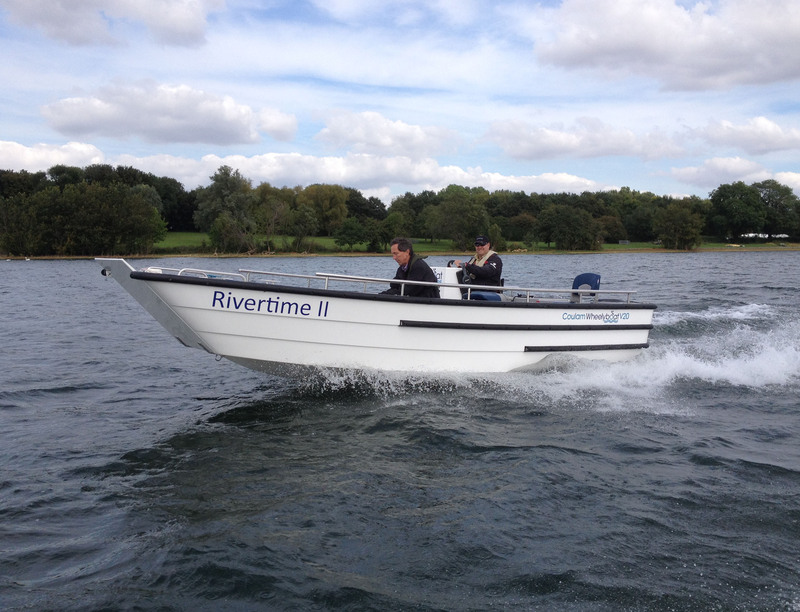 The 17ft Wheelyboat Mk.III was commissioned by the Wheelyboat Trust for use by wheelchair anglers on European rivers and lakes and is designed to meet RCD Cat.C carrying two wheelchairs and two able bodied, or five able bodied. She is of welded aluminium construction and has an inverted vee bottom configuration which gives her good performance and handling under way, and stability when beached for loading through her bow door. There are 33 examples in use across the UK. With the build cost of the aluminium Mk.III becoming too high and with an emerging requirement for a slightly larger and faster boat the decision was taken in 2013 to develop the Mk.V. This GRP 20footer was developed in conjunction with J M Coulam Boatbuilders and was launched in 2015. Aesthetically she follows on from the Mk.III but has a more conventional shallow vee bottom and is capable of speeds well over 20knots. She is certified for 10 persons for RCD Cat.D and 8 persons for RCD Cat.C, and can comfortably accommodate six wheelchairs plus a couple of helpers.